Less than two years after placing the 1-ton Curiosity rover gently on the Martian surface, NASA is already dreaming up ways to land even bigger spacecraft on the Red Planet. The space agency is developing gigantic supersonic parachutes and lightweight, saucer-like inflatable "decelerators" that will slow the descent of heavy gear through the thin Martian atmosphere, thus allowing large objects — such as human habitat modules — to make it to the planet's surface in one piece. "But also, we think these technologies are extensible for eventually being used to land even human-class payloads— things in the 10- to 15-ton range," Clark told Space.com. "Not with the technologies themselves — perhaps clusters, multiple parachutes being used to generate just enormous amounts of drag that would be necessary for payloads of that class." The LDSD equipment could also be used to land payloads on other bodies with atmospheres, including Earth, NASA officials say. Putting a lander, rover or other piece of hardware down on Marsis tricky because of the planet's "in between" atmosphere, which is just 1 percent as dense as that of Earth. There's too much air to rely solely on rockets to slow a craft's descent, but not enough to use just parachutes and air friction, as can be done here on Earth. The Curiosity rover, for example, hit the top of the Martian atmosphere going about 13,000 mph (21,000 km/h). Friction against the robot's 15-foot-wide (4.5 meters) aeroshell helped slow it down to about 900 mph (1,400 km/h), at which point the spacecraft deployed a parachute measuring 51 feet (15.5 m) across. The success of Curiosity's landing in August 2012 validated this bold design, which will likely be used again on Mars. But payloads much bigger than Curiosity will require new equipment, Clark said. "It pretty well saturated the capabilities that we have to land things on the surface of Mars," he said. "If we want to go bigger, to higher elevations, and more accurately, we need technologies beyond what we currently have." That's where LDSD comes in. The project is developing a new 100-foot-wide (30.5 m) parachute, along with two balloonlike devices called Supersonic Inflatable Aerodynamic Decelerators (SIADs). One of these, called SIAD-R, is 20 feet (6 m) wide; the other, SIAD-E, measures 26 feet (8 m) across. Each SIAD is designed to fit on the outer rim of an atmospheric entry vehicle. The device would inflate at speeds of about 2,660 mph (4,280 km/h), providing enough additional drag to slow down the spacecraft to around 1,520 mph (2,445 km/h), at which point the big supersonic parachute would be deployed. While this new gear could handle heavy loads, it would still need some help from a sky crane or other device to slow down a payload to soft-landing speeds, Clark said. In their current incarnations, the SIAD-R and big parachute weigh about 110 lbs. and 220 lbs. (50 and 100 kilograms), respectively. Using them would allow a Curiosity-like mission to deliver about 1 additional ton to the Martian surface, Clark said. The LDSD project is gearing up for a major milestone: its first flight test, which is scheduled to take place in June from the Hawaiian island of Kauai. During the test, a balloon will carry a test vehicle equipped with SIAD-R and the big parachute to an altitude of 23 miles (37 km). A rocket on the vehicle will then kick on, taking it to supersonic speeds and an altitude of about 34 miles (55 km). The air is thin at such heights, so it serves as a good analogue for the Martian atmosphere, Clark said. The SIAD-R and parachute will then deploy in succession. Researchers will analyze how the system worked, and they won't be terribly upset if something goes wrong. "We're doing something that hasn't been done before," Clark said. "While I'm optimistic that things will go well, if they don't, that's probably even better, because we tend to learn more from the failures than from the successes." Two more stratospheric flight tests are on tap for next year — one in June and the other in August. The current plan is for a SIAD-R to go on the June 2015 flight and a SIAD-E on the August mission, Clark said. 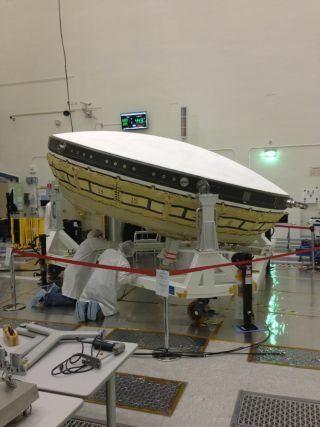 If all goes well, LDSD technology could make its way to Mars in the next decade or so. NASA plans to launch a Curiosity-like rover in 2020 to search for signs of past life on Mars. The 100-foot-wide parachute may be ready to go for that liftoff, but that mission probably won't need it, Clark said. NASA wants the 2020 rover to gather and cache Martian samples for eventual return to Earth. The mission to retrieve those samples — whenever it launches — will probably require the big chute and perhaps one of the SIADs, Clark said. "Looking even beyond that, we start thinking about human precursor-class missions — so, maybe something in the 2- to 3-ton [range]," he added. "That's something that a combination of a SIAD and our parachute would benefit." And clustering four or five LDSD parachutes together could help land even bigger payloads, perhaps paving the way to put boots in Mars' red dirt. "Now you're starting to talk about 15 tons on the surface, and those are human-class payloads," Clark said.